The Shunga Oriental bath salts are a great addition to my bath stuff collection. They smell great, feel great, and are packaged beautifully. The only problem is the glycerin, it wasn't a problem for me but it could be a problem for many. Still, a wonderful product that I will recommend to everyone looking for great bath salts. I was so excited to get these bath salts, and they did not disappoint at all. 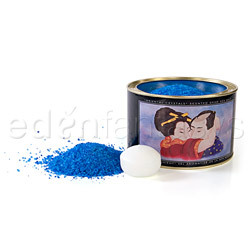 The Shunga Oriental Bath Salts are very pleasantly scented and dissolve very well in hot water. These salts are great for a sensual bath alone, or for a couple's bath if you are lucky enough to have a large enough tub. These would make a great gift to anyone who likes fragrant baths. There is glycerin in these salts so if you are sensitive to that, these wouldn't be good for you. I personally haven't had any problems with the glycerin as far as irritation or infections go. These salts are fine in consistency and dissolve very well under hot running water. They are not quite as fine as sand, just a bit grittier than that. Once they are dissolved, they make the bath water feel very silky and smooth on the skin. They are very easy to dispense, there is a seashell scoop that is used to measure out the salts to put under running water. After you get out of the bath they leave your skin silky soft. They don't feel sticky or greasy, just very very soft. The Shunga bath salts come in two scents, Ocean and Aphrodisia. I got the Aphrodisia scent. It is a very strong, clean scent. It smells just like a bar of Dove soap. I love the scent so much and love taking a bath in it. If you sniff it right out of the tin it is EXTREMELY strong and may be too heavy for some. Once it is dissolved in the bath water, the scent is much lighter and is very soapy smelling. After you get out of the bath it leaves that soapy scent all over your body. It makes me feel very clean and refreshed. This product is not meant to be ingested, so I did not try to taste it. I could imagine that it tastes HORRIBLE if it were to be ingested by someone...don't know why someone would try, but thats besides the point. These bath salts last quite a while. They turn the water a pretty blue color and that lasts the duration of my bath which is about 30 minutes. They produce a nice thick layer of bubbles on top that last about 15 minutes, then they start to dissipate. They don't leave any stickiness or greasiness on your body so there is no need to rinse this off. As far as the tub goes, just rinse it out and wipe it down with a wash cloth and your tub will be squeaky clean and smell great too. So it does clean up very easily. My whole bathroom smells great after using this. There isn't really anything I don't like about this product, I think it works great, smells amazing, and makes my skin feel very silky and smooth. There are some allergy concerns with glycerin as an ingredient but personally, I had no problems with it. Please keep that in mind though before ordering this if you have had sensitivities to glycerin. These salts come packaged in a very nice black tin with Shunga art on it front of it. You get 20 ounces of bath salt in this tin. When you get these salts, they are in a plastic bag inside the tin closed with a twist tie. I took the salts out of the bag and just put them directly in the tin. It was easier for me and less messy. There is also a seashell in its own little bag that is to be used as a scoop. Its a very nice touch. There is also a floating candle sitting on top of the bag of salts that is scented the same as the salts. I haven't tried the candle yet so I can't comment and how it burned and smelled yet. The lid on this tin is very unique. It actually pops open like a paint can and comes with a little ribbon with a little round wooden disc at the end that is used to pop the lid open...very cool feature. Overall I would say that the packaging was done very tastefully. I love the pop top, definitely one of the coolest things I've seen in a while...yes I live a very sheltered life and am VERY easy to please. Little things do excite me. Love these salts!! The packaging is adorable and they smell AWESOME! I have taken at least 6 baths with this and still have more than half the tin left...so they are lasting a while. I only use one scoop of these because the scent is VERY strong, but very pleasant. I have had no infections or irritations from this either so that, of course, is a good thing. I highly recommend these because of the great quality and very reasonable price point. Give it a try! These look so pretty. Glad to hear they worked so well for you. They are great!! I have the Kama Sutra ones too and I love them both sooo much. We love these bath salts. They make the water so pretty blue. I really want some of this. I love a good bath with the husband! I love bath salts. This one seems great. This looks so nice. I would be worried about the blue staining my bathtub, but, oh well! Thanks for the review! Thank you for viewing Shunga oriental bath crystals – sensual bath review page!